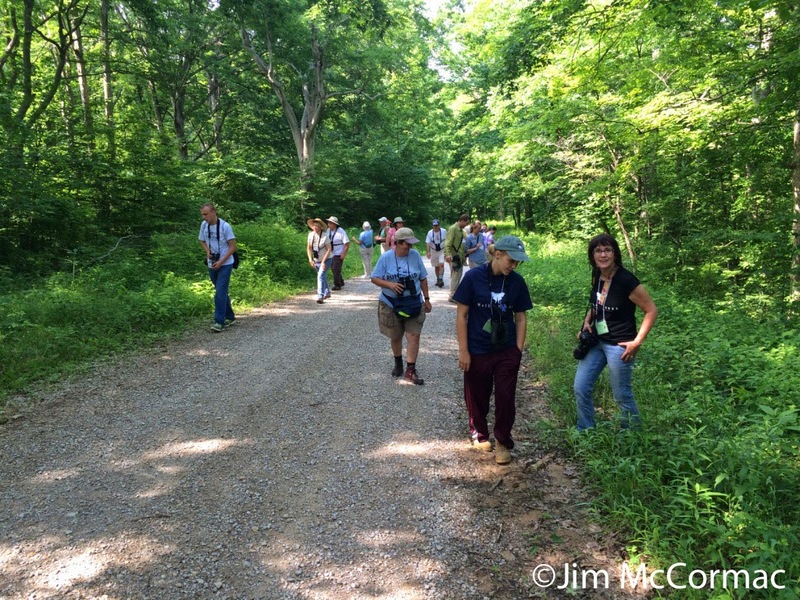 Ohio Birds and Biodiversity: Mothapalooza invades Burr Oak! Last weekend saw the massive moth conference, Mothapalooza II, invade Burr Oak State Park in picturesque southeastern Ohio. Possibly somewhat strangely to the lodge's staff, a Bigfoot conference took place here the weekend before. At least we could show them our subjects of interest. One hundred and fifty participants convened, from ten states and Canada. In this photo, your narrator debriefs with up and coming uber birder Alexandra Forsythe (her website is HERE) and her mother Cheryl. 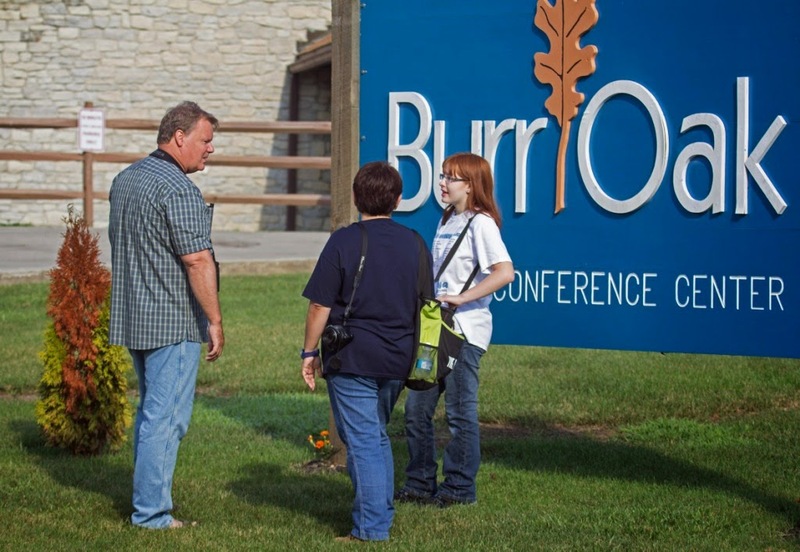 They traveled from Indiana to attend the conference. Alex, who is 15, already possesses awesome field skills. This photo was taken just after a 7:30 am bird walk around the lodge (crazy us; we were up until 2 am mothing! ), and we had just escorted 30 other hard cases to look for birds. Alex found us many interesting species, including an eastern kingbird nest with two chicks about ready to fly the coop. Mothapalooza draws a diverse demographic, including many sharp young naturalists and biologists. It's great to see such interest in natural history among a younger crowd; all too many of these sorts of events tend to be comprised of aging silverbacks such as myself. Nothing wrong with that, but we do need to think about the next crop of conservationists. I snapped this photo with my iPhone on one of my innumerable trips in and out of the lodge. The parking lots are jammed. All of those cars, excepting the staff, are moth-ers! It was very cool. Everyone you would encounter was there for moths, and it was truly a great crowd. Sometimes events can be a bit low-key, but that wasn't the case here. Dinner, pre and post talks, on the buses, it was always happy chatter. Happy chatter is the earmark of people having a good time, and that's what we hoped for. Burr Oak State Park is well off the beaten path, but most definitely worth visiting. The lake behind the lodge is beautiful, and the surrounding landscape is heavily wooded and full of flora and fauna. CLICK HERE to learn more about the park and its lodge. Part of the Mothapalooza team poses post conference. From left (back row), it is Dave Horn, Mary Ann Barnett, Olivia Kittle, Elisabeth Rothschild, Scott Hogsten, and your blogger. Front row, from left, we have Diane Platco-Brooks, Fiona Reid, and Candice Talbot. Missing committee members are Dave Wagner, Tami Gingrich, Amy Mauro, and John Howard. I could say lots of great things about all of these people, and the numerous other expert moth-ers, van and bus drivers, and volunteers that made Mothapalooza possible, but this would turn into a very LONG blog post. Suffice to say that we were fortunate to have most of THE BEST lepidopterists and naturalists around involved, and that's what makes Mothapalooza such a special event. I do have to single out Mary Ann. She got on board with the concept from the beginning, and has served as our CEO for both Mothapalooza I and II. Without her talents, organizational skills, and hard work, it wouldn't be possible. 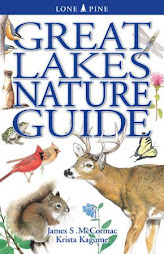 We are also grateful to the Ohio Division of Wildlife for its support of Mothapalooza and natural history in general, and the Ohio Lepidopterists for their invaluable assistance. Please CLICK HERE for the complete roster of our supporters, all of whom we greatly appreciate! And keep in mind that National Moth Week soon approaches! An avid group of moth-ers clusters around a sheet late at night, ogling all manner of interesting creatures. Mothapalooza field trips are quite unlike other conferences that I've been part of. We don't head out until dark, and many people did not return to the lodge until 2 or 3 am. We probably had a better shot at seeing the (mythical) Bigfoot than the people at the previous week's conference did! There were five mothing stations scattered around the area, each rigged with light traps to lure in our targets. A fleet of vans, driven by wonderful volunteers, regularly visited each site, taking people to and fro. Organizing and managing all of that was a major headache, and kudos go to Olivia Kittle and Elisabeth Rothschild for taking all of it on and handling logistics beautifully. We also owe a big debt to moth expert Diane Platco-Brooks, who opened up her property, Brookside Haven, to Mothapaloozians. Diane's place is fabulous and moth-filled, and was the hand's-down favorite site. What a gracious host, to allow two nights of raving moth fanatics to invade and moth until the wee hours! It wouldn't be much of a Mothapalooza without moths, but we had plenty of those. This was a "life moth" for your narrator and many others. It is a pink-legged tiger moth, Spilosoma latipennis, and a showy creature it is. 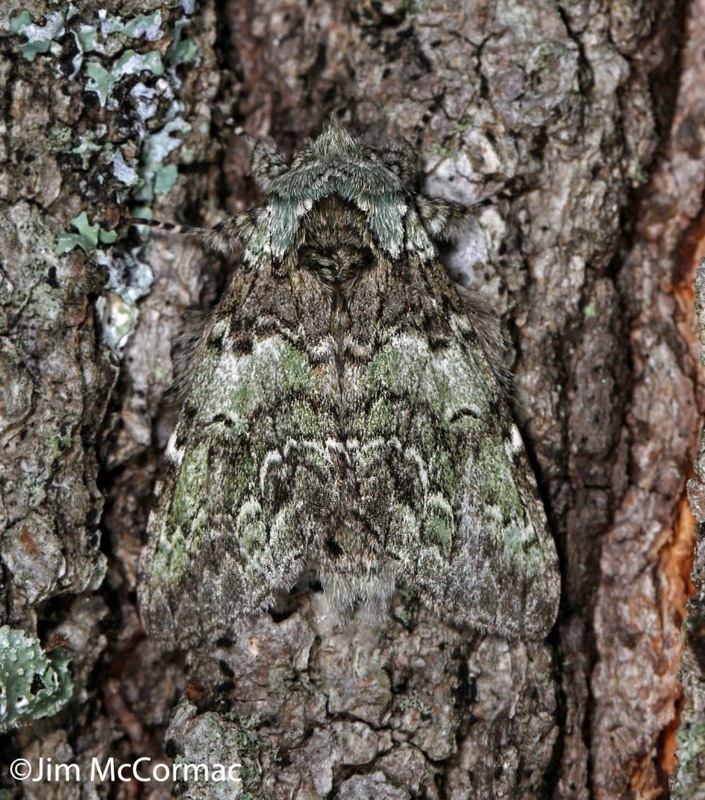 We were dazzled by the incredible camouflage of this mottled prominent, Macrurocampa marthesia.It is a lichen mimic, and when at rest on lichen dappled bark the moth essentially becomes invisible. We saw much more than moths. 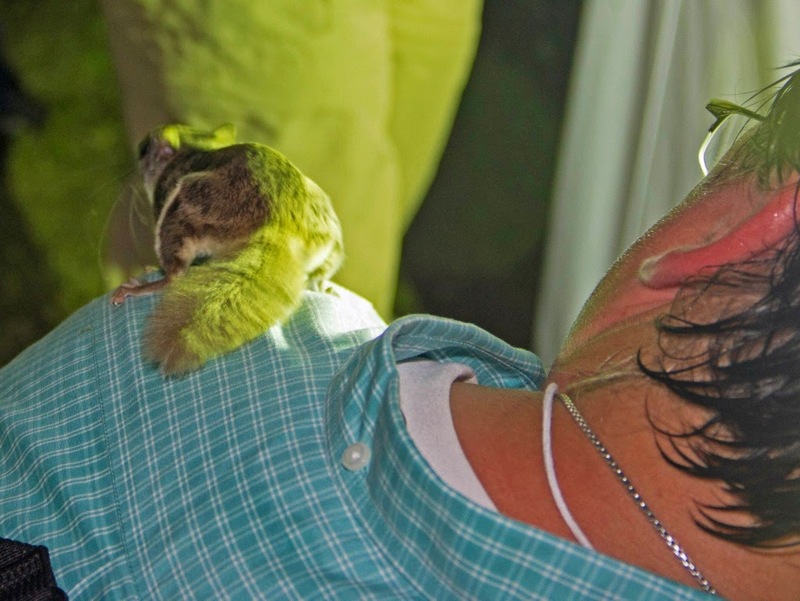 This southern flying squirrel caused a stir when it glided down from the trees, landed on Brian Herriott's shoulder, bounced off him and onto a lady standing nearby, then shot back into the trees. Diane Platco-Brooks also had feeding stations stocked with crunchy peanut butter, and her flying squirrels entertained scores of people. Scott Hogsten found this oddity. It is a wasp mantidfly, Climaciella brunnea, which is sort of a mad scientist melding of a dragonfly and a praying mantis.This species is also an excellent wasp mimic to boot. The reproductive strategy of mantidflies is every bit as bizarre as the insect's appearance, but that story will have to wait until another day. 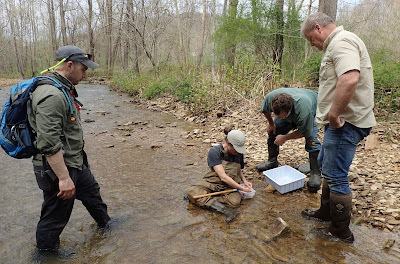 We also had day field trips to varied habitats. This fine group was part of an excursion led by John Howard and myself which ventured into the Wallace O'Dowd Wildlife Area. There were many highlights, not the least of which was an eye level summer tanager hunting wasps and bees within twenty feet of the group. We also stumbled into this little Cope's gray treefrog, who remained tucked into its Bhuddalike stance, regarding us with utterly inscrutable eyes. It remained silent, but at night the treefrogs came alive. I made a post about the frogs at Diane's place RIGHT HERE. It was only fitting that David Wagner's Saturday afternoon field trip group found this extraordinary beast, the paddle caterpillar, Acronicta funeralis. 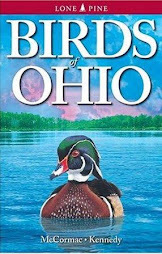 After all, it is prominently featured on the cover of his book the Owlet Caterpillars of Eastern North America. It uses those strange paddle-tipped threadlike structures to flail would-be predatory insects such as ants, flies, or wasps. Soon, I'll slap up a moth-heavy post. We found legions of ultra-cool moths, and I look forward to sharing some of them. Thanks to everyone who made Mothapalooza a big success, and traveled from near and far to be a part of it. We are already cooking up plans for Mothapalooza III! It sounds wildly successful! I wish I could have attended, and I certainly appreciate reading your account of this splendid event. I love the angle you shot that Spilosoma Jim. Looks like he's wearing a white tux and pink bow tie. I'm wondering if you're going to tell how many moth species were found at this event? It seems like the park spans a few counties, do you break down the species count by county or is the event all in one county? 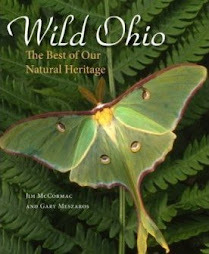 One reason I ask is that I like to show that the number of moth species is way, way higher than what's indicated on the "BAMONA" site for most Ohio counties, because of the low volunteer participation rate for moth watching versus butterfly watching. Donald, we plan to document our moths via Project Noah and will include the locations. In addition, we did keep a checklist of species seen during the event and hope to publicize that in the coming months, although we don't have those sightings broken down by location... Lisa, maybe you can make it next year - we'd love to have you! Thanks for posting about Mothapalooza. We had a really great time and wouldn't have known about it if it wasn't for your blog. Hopefully we'll be back again next year! EPN Breakfast/talk/walk - July 8! A "life" snake!!! And more snakes!